Discussion in 'Hewlett Packard' started by krish, Jun 16, 2013. This is an update on the HP Executive Tablet Pen for the "G2" Atmel devices. In my case it is for my Elitepad 1000. As of this writing we know there are two versions floating around; R1 and R2. I believe mine to be an R1. After approximately 3 months in service I began having issues with the pen shutting off and not waking up. It also began skipping while inking and exhibited very short inking times where it would turn off and not come back to life. Trying to select things on the screen was also difficult because of the intermittent operation. One would think this was a battery issue but opening the pen and mechanically cleaning contact surfaces on my shirt would get it working again. Like the early N-trig pens or the new Dell Synaptic pen, this is consistent with contact corrosion as a root cause. Contact corrosion has basically similar symptoms as a dying battery. The resistance of the contacts creates a voltage drop that reduces the potential of the battery. In effect it makes a fully charged 1.5v battery seem like it is a much lower voltage. The contacts in the 'circuit' are as shown in the photo below; 1 and 2 are on the battery, 3 is the spring at the end of the barrel on the inside, 4 is the threads on the inside of the barrel, 5 is the positive tang on the circuit board, 6 is the threads on the housing, 7 is the field coil on the front of the housing, and 8 is the pin on the nib. The cleaner I tried is the CRC Electronics Contact Cleaner. 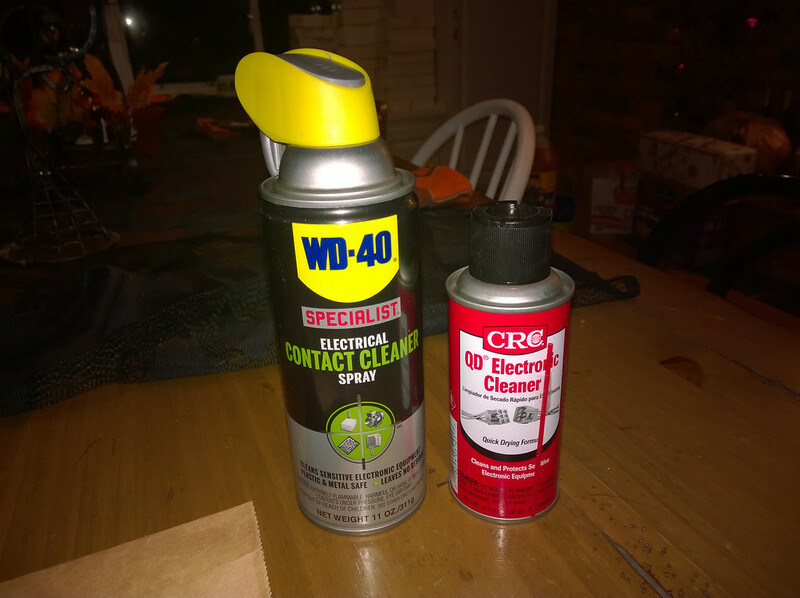 I will save the WD40 in case the CRC fails. I sprayed each of the 8 Contact areas and then used a paper towel to mechanically clean the area. I let it all dry for approximately 15 minutes and then reassembled the pen. It has worked well enough now to allow me to write this entire post. My inking performance has been restored! If your pen is exhibiting these symptoms and your battery is still 1.0v or more as checked with a volt meter, then cleaning is needed. 2.0™ and JoeS like this. I'm thinking of trying a conductive grease/compound on the barrel thread. That's where most of the corrosion exists when it occurs. That sort of grease/compound should prevent corrosion from occurring. Just have to find a small size supply of it and make sure it's compatible with aluminum. When this conductive paste is used on aluminum connectors in joints, NO-OX-ID "A-Special" prevents the reformation of oxide films, which cause high resistance and subsequent failures. Ordered it. Will document my findings and post pics when I get it. Yup, I used mechanical cleaning and CRC Dielectric Grease on my Elitepad 900 pen and that revived and extended the life significanltly. In the end it still died so the corrosion is more than just oxydation on THAT PEN design. I have no doubt that the same treatment on the G2 pen will revive the pen for a significant time. So far just cleaning has worked well on my pen but it lasted about 2 to 3 months when I first got it before showing symptoms. I thought at first to use a dielectric compound. The only thing about dielectric grease is that it is insulating instead of being conductive. That's why I was on the hunt for an electrically conductive compound to help prevent the corrosion and oxidation that occurs with the type of circuit all the while maintaining a high degree of conductivity. This tablet is awesome especially after the touch panel firmware update. But owning to Wacom pen-enabled tablets whose pens just work all the time, it's tough not being able to rely on the Atmel pen at least 90%+ of the time. At some point I am really losing faith and hope in the PC industry and better move on with an Apple product and switch back to pen and paper for note taking. HP Elitebook 2760p for nearly 7 years!! HP Elitepad 1000 G2 - Loved it, for a very short time only! Fujitsu Q 572 for 6 mo. Lenovo X201t for 18 mo. I hear you my friend. But I'm old school and like a Marine, I've learned to make do. But yes, it is mind boggling that they can come to market with something that isn't at least on par with what Wacom has had for years. I've owned 3 Wacom tablets and apart from the edge issues, they just worked all the time. My current Wacom tablets also just work and have markedly improved edge accuracy thanks to new generation of drivers. You can take notes on an iPad using a capacitive stylus. But you have to get used to writing like you're using a crayon on craft paper. There are a few pens with narrowish nibs, but they have their issues also. Plus palm rejection is relegated to a hand few pens and apps that support them. I guess there's just not enough demand for serious research into the perfect inking solution. For sure, there is no reproval against you or dceggert and I appreciate your sharing of insight knowledge. I really do! I am just sick of Dell and HP always sticking in the mud of emerging pen technologies, which are then being dropped again, when they actually work. Why didn't they choose N-Trig? No, I am not going for an iPad, either. Just plain and simple MacBook (Air/Pro) and pen and paper, that's it...Using an iPad for sophisticated note-taking is not going to work in my point of view. "I guess there's just not enough demand for serious research into the perfect inking solution." Yeah, maybe and apparently not enough money for N-Trig technology, either! Don't get me wrong, I will continue using my EP for now. However, as soon as problems will occur in that kind of way, that it will become a pain in the ***, I will sell it and look for something else. I assume this will take 1-1.5 years, would be a real damage of my view on HP's products, if it's less than that! Perhaps the best possible solution to abate the pen corrosion issue is to use a compound that prevents it from occurring all the while maintaining high conductivity. To that end, the electrical contact grease product named NO-OX-ID "A-SPECIAL Electrical Grade" fulfills the aforementioned requirements. So I bought a small 3" tube off of eBay for $4 shipped. Unscrew the pen tip from the barrel. Clean the (+) battery terminal on the back end of the pen tip. Clean the (-) spring loaded battery terminal inside the pen barrel. Apply a liberal amount of NO-OX-ID compound on the pen tip's threads. Remove the pen tip and clean it in similar manner then apply a liberal amount of NO-OX-ID compound to the copper part of the tip. Reassemble the pen wiping any excess compound that may have been squeezed out at the seams using rubbing alcohol. You should note not only improved pen response, but somewhat improved sensitivity. The first time you use the pen, you should hold it steady on the screen for 10 secs so it auto-calibrates. The good news is, you won't have to reapply the NO-OX-ID compound on the pen for quite a while as it is very durable. Check it between battery replacements and if it appears very dark to black, then clean it off and reapply new compound. Perhaps a dab of compound on the battery's ends each time you change batteries would ensure optimal performance. I'm wondering if they will ship the same version of the pen for the new Envy x2 tablets or if they are planning to offer a new version - which Envy x2 owners needs an Executive pen?